This article is meant to help you integrate Modxcloud to upgrade MODX Revo safely. And more specifically, it is based on my experience running MODX in a (gulp) shared environment. When upgrading MODX from one version to another there is always that sinking feeling that occurs right when you complete the upgrade process: what if anything will break and what will I have to fix? Want to get rid of that pit in your stomach? Want a faster simpler workflow? Great. This post is for you. The old way to upgrade in a shared environment. My old way to upgrade was less than perfect, but here it is. Create a backup of all site's files in event that site breaks after upgrade. Extract the archive on remote server in subdomain. Install new version of MODX in subdomain. Typically I would work with two instances of phpmyadmin open side by side so that I could compare the values of the ids of each row to make sure that there wouldn't be any duplicate values from old table and new table. Copy all relevant site assets from preexisting site, into subdirectory. This includes all image, css, and js files. Log into manager and test it to make sure that all the extras work inside manager. If everything works fine, you are good to go, and then you can do an upgrade. Go into system settings and search for "Site Status". Change it from Yes to No. This will briefly take down website as you upgrade it. Remember that zip file of your new MODX version? It is time to extract it into the root directory of your site. Drag the setup folder into the root directory of your old MODX install. Overwrite the old MODX files. Drag and copy drop the following folders from your test install: connectors, core, and manager as well as the index.php file into the root directory of your MODX install. go to your http://yourdomain.com/setup and follow upgrade steps. Delete all the files in the test subdirectory. Delete all files inside the folder created when the new version of MODX was extracted from the zip file. Enough of that right? Want a simpler way? Modxcloud has an ingenious tool called vapor that allows you to take a snapshot of all the files in your current modx install and save it into a zip file. They provide excellent directions on how to use the vapor tool too. While you can package an Advanced install, Advanced installs are not yet available on MODX Cloud. Your site will work with the default core and Manager locations. We have not tested the import of 2.1.x sites. You're welcome to! There is a known issue that requires special attention for sites with Articles installed on Revo 2.2.0. See below for instructions. From your browser navigate to the vapor/vapor.php file which will start Vapor. If your site is at http://yourmodxsiite/ you'll want to go to http://yourmodxsite.com/vapor/vapor.php. Take a break and grab a quick snack (I prefer chips and salsa) while you wait for the notification email that the snapshot has been successfully imported. Once you receive the notification, go to the vaults section, find your newly imported snapshot and click "Create a new Cloud from Snapshot"
At next screen, Give the cloud a name, and choose the cloud location closest to you. Make sure development cloud is selected, and click "Complete Cloud Creation"
Pro Tip: This will create a cloud with the most recent version of MODX. This will force you to upgrade directly and skip other steps inside upgrade path. There is an alternate method which is to go to Clouds page, and click new "Cloud". Notice the "Change Version" link. You can change that version to match the version of your snapshot. That will allow you to upgrade the product up the upgrade path in steps. Most of the time this is totally unnecessary. 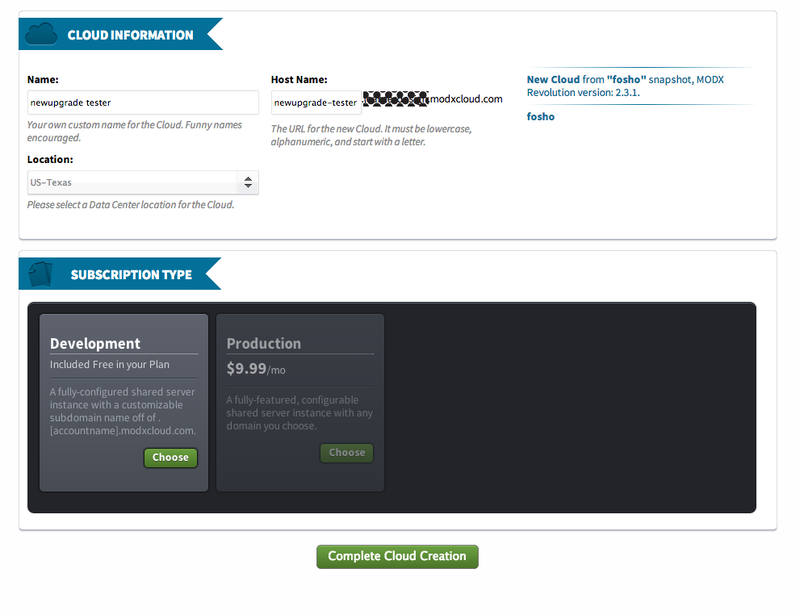 Once we get it we will go to clouds section inside modxcloud and click on name of new cloud. Once inside the selected cloud we need to Install phpmyadmin so that we will be able to export the database. Using your favorite ftp program, create new connection using the settings found inside the "SSH/SFTP Connection Information" Section. Pro Tip: When setting up the the connection inside your FTP program remove the username from the front of hostname. If modxcloud says your hostname is cxxxx.paas2.tx.modxcloud.com, you would insert paas2.tx.modxcloud.com into the hostname field in the FTP program. Clear your Internet browser's cache. Now that the background work is done, create a new admin user, and wait for notification that it is successfully installed. While you are waiting for notification, click "View Site" and go through site page by page, noting anything that doesn't work as anticipated. Go around manager taking note of anything that doesn't work as anticipated. Remember that list of compatible extras? Well now is the time to look at your extras and compare them to the compatible list, and upgrade them to most recent versions while dealing with any issues that come up. This can take time. Troubleshoot any other weirdnesses inside manager and in front end. Once site works as anticipated in modxcloud, take a break and give yourself a high five, you deserve it. 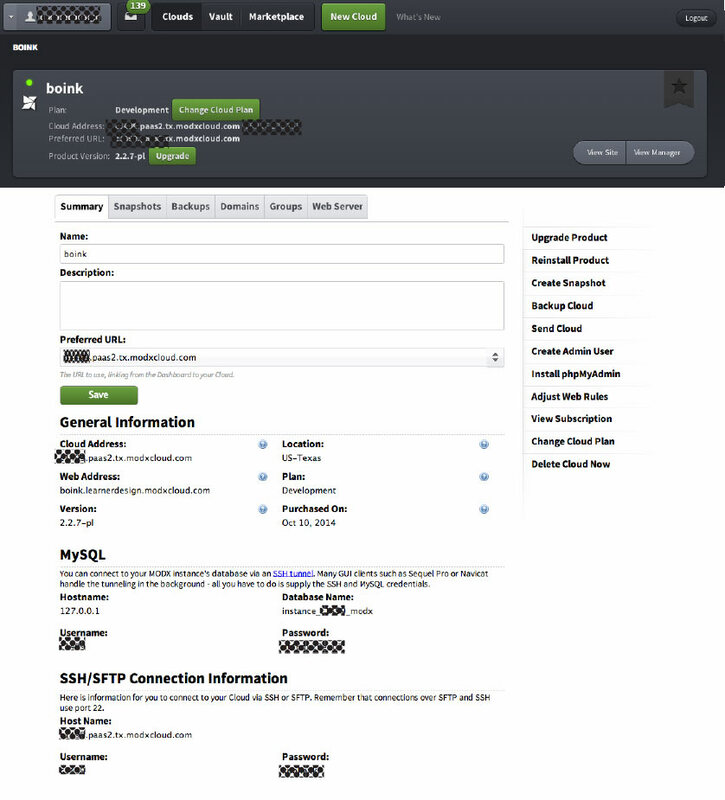 Export database using phpmyadmin that we installed in step 5. Put site status into inactive mode inside Site Settings. Create Backup of old database. S%$t Happens, make the backups. Connect to old site via sftp /ftp and manually remove all folders/files from the core/cache folder and then clear your browser's cache. Connect via sftp to both your modxcloud site in one window and your old site, in another window. If your ftp program allows you to ftp from one remote domain to another, drag and drop the site files into root directory of target site. This will overwrite your old site files. Browse around site and confirm that everything works as anticipated. Once you are satisfied that everything is hunky-dory., put site status back into active status. So now that we are done with tutorial, it is time to ask ourselves a couple questions. 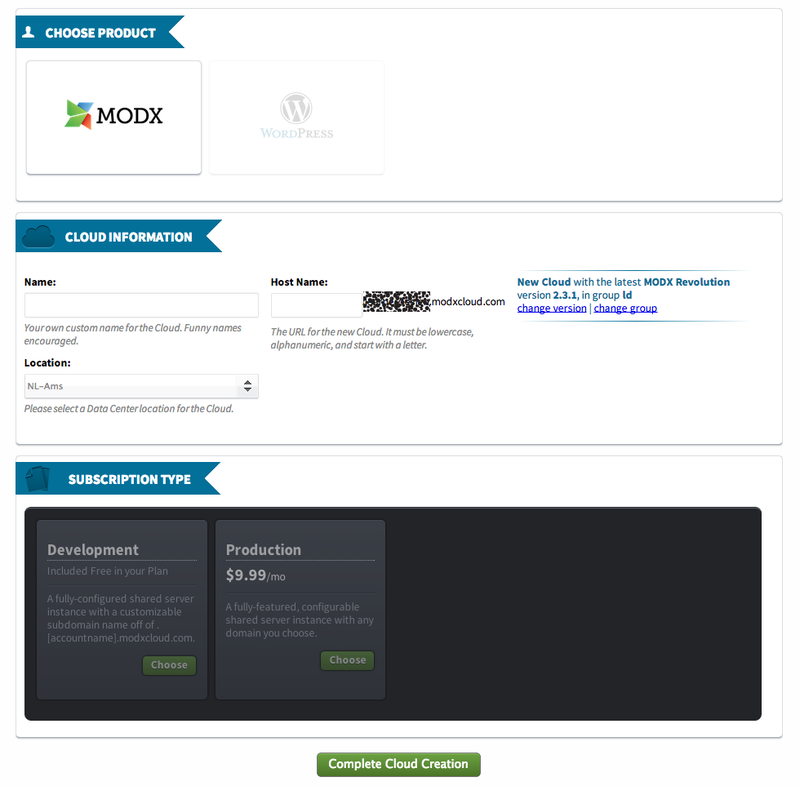 Why not use Modxcloud for all your sites in the first place? That is a great question Noah, and one that we should all consider. It is outside the scope of this quick post, but I will follow this post up with another one about doing just that. Why is this a better workflow anyway? The biggest reason that this is better, is that the troubleshooting process is much faster (as is everything else) inside the cloud. Another compelling reason is that your testing environment is wholly separate from your live environment. This allows you to make mistakes, and worst case scenario, easily delete the cloud and start over if need be. The opportunity to make backups along the way, allows you to easily revert to a backup as well. This post was not meant to be the only way to utilize Modxcloud, it was just a reflection of a recent troubleshooting venture gone right. I look forward to your feedback and will incorporate it into the post to make this more useful to other MODXers.